"How to Get Rid of Pimples?" - "How to Vanish Acne Marks" - "How to reduce Aging Sign?" I know, we all have Googled these questions don't know how many times. These pimples & marks irritate everyone. Whether it is teenager acne or adult acne or just because of skin disease, they lower our confidence. Clear Skin is a dream for everyone & mine too. From my teenagehood, I have an extreme love for trying out new cosmetics & maybe because of this habit, somehow I Played with my skin. I have tried so many products for acne & some of them worked too. But for marks, I struggled a lot. I used to get new pimples every time. Tried so many Home Remedies, costly products, organic products, they worked, but not for severe marks or blemishes. I have noticed the change in my skin (A positive Change) from so many products but not 100%. Or they take so long to start working. Also, I want you to know that I faced Eczema when I was a child. And in my teenagehood, I faced bad skin disease. 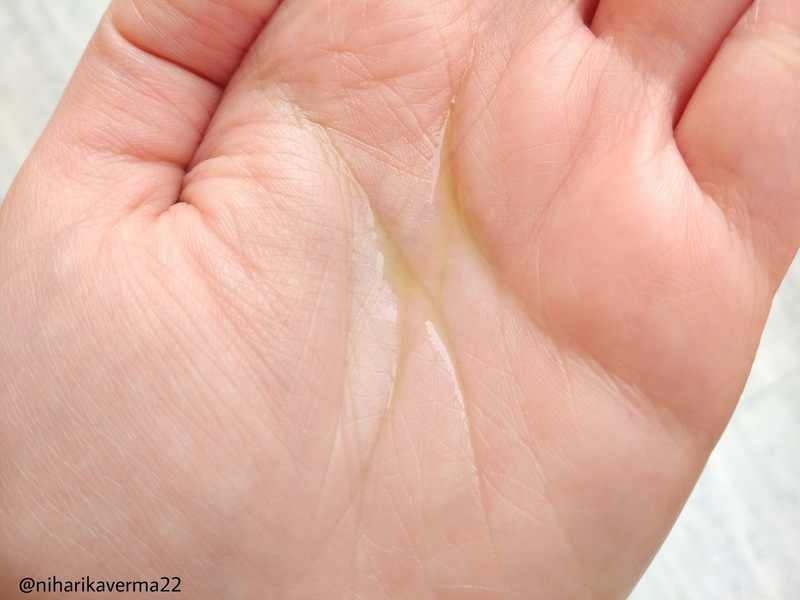 And when you have eczema, your skin becomes so sensitive & reacts to every other thing. Whether it is a product or climate change or anything. Herbs were once widely used by ancient civilizations for their therapeutic properties. Today, we live in a symptom-based society where we heavily rely on synthetic drugs, without ever getting to the root cause of health issues. At LŌA, they believe in the power of plants to heal and protect our bodies and want to get as close to our natural way of living as possible. They have gathered some of the most potent scientifically-proven botanicals found on Earth to help heal the underlying causes of skin conditions. Our proprietary infusing process allows us to naturally extract the important compounds found in whole plants, and synergize them all together into one working force. This journey has led him to take on a healthy, vegan lifestyle. Lōa is a reflection of his love for nature, health, and beauty. 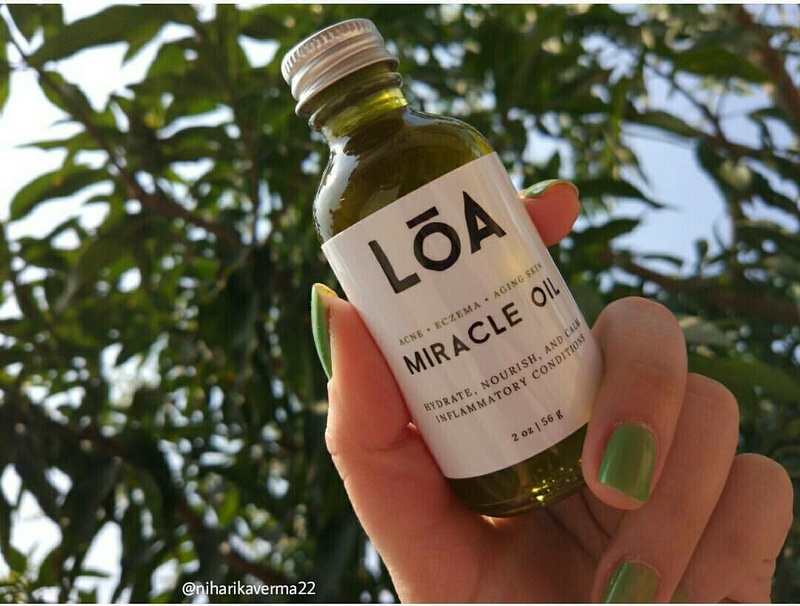 The secret behind Miracle Oil is its rich content of skin-loving omega-3 and 6 essential fatty acids, and cell regenerating phytonutrients. These are crucial components for combating inflammation, balancing nutritional deficiencies, and restoring the skin's natural moisture barrier. It effectively soothes inflammatory skin conditions and irritations by quickly reducing dryness, itching, swelling, redness, pain, and the overall severity associated with them. Miracle Oil also acts as an arsenal against free radical and UV damage and helps to preserve the integrity of the youthful skin. The description does not end here. This Oil in my view is a complete science & lot of hard work & dedication is involved behind this. 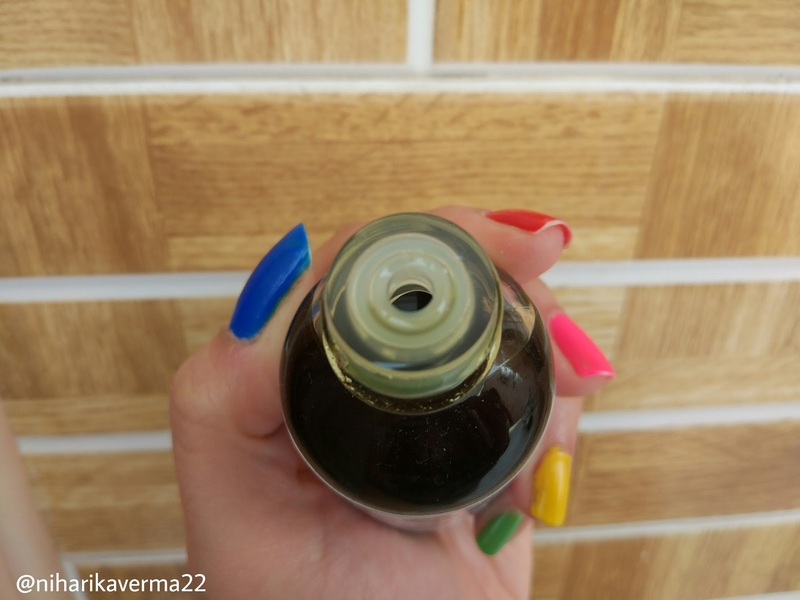 I want you all to have a look at the Blog post "How Miracle Oil Helps To Heal Acne, Eczema, and Psoriasis" to understand the product & ingredients from within. 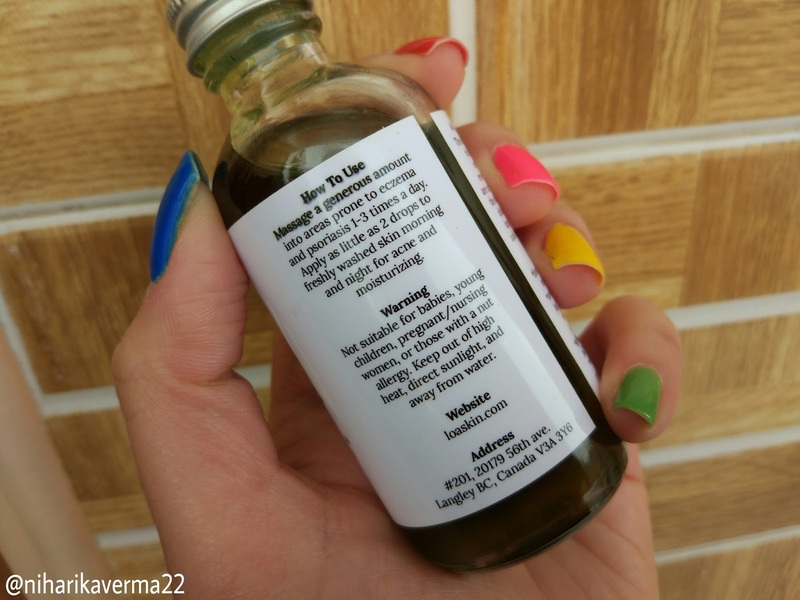 Apply as little as 1-2 drops in morning & night on the freshly washed skin for acne healing & moisturizing. Niume.com | Best Blog Monetization Platform | Get Viewed - Get Paid! Packaging: It comes a handy solid glass bottle with a revolving cap and has inner protection too to avoid leakage. First I thought it'll be a tough to thing to control the flow of the liquid but the lid ensures that the oil only comes drop by drop only when you tap it on your palms. So no problem of leakage. Also, all the ingredients & directions were there on labels so a plus point for packaging. Color & Consistency: It has Olive Green Color & the consistency of Oil is not too thick. I mean it is easy to spread & massage oil on face. 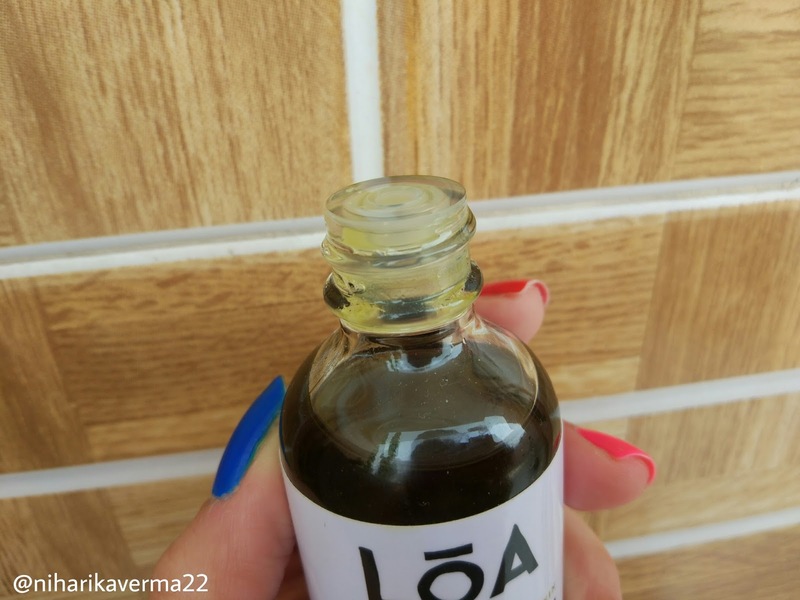 Only 2 drops are more than enough to cover the whole face or else you will oiliness. Fragrance: None as such. Sometimes it gives the feeling of a mixture of mustard oil & some other oils but it will not irritate the nose. Effectiveness: I'm saying it proudly, that it worked from the "Day 1"! I massaged the oil on my face before going to bed & next morning I saw 50% reduction in marks overnight. Everyone in the family was shocked to see that result. And I use it daily 2-3 times. In a week only, it dried all my pimples, vanished the redness & started working on the blemishes. Honestly telling I don't have before-after images because I don't have DSLR for clear images & selfie won't work. But believe me, the result was 100% noticeable. Its been a month now & it has reduced those major scary red boils & I haven't got any new irritating bad acne. Not only this, because of season change I faced some flaky skin issue & this worked on that too. I've never seen anything which works on marks & dryness so fast. There is a difference is skincare regime when you have a skin which has gone through so many skin disease. Normal acne products or commercialized products won't work for you. I know it's a bit costly but this will work for you for sure. Before going to bed, I apply a bit more & massage my face for 5 minutes because during the night our skin repairs & it needs extra. I have oily skin but was facing dryness issue during season change. This oil maintained moisture level. 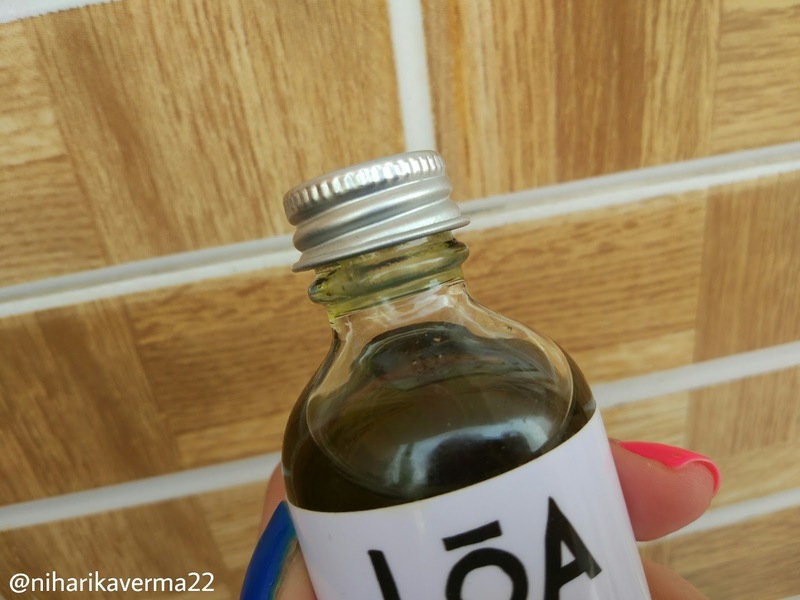 Being an oil it doesn't make your skin greasy or uncomfortable & gets absorbed easily. Also, it does not clog the pores. If you are facing inflation issues or simply redness this will work for you. In two days maximum, your skin will be free from such irritation. Talking about the effectiveness on aging signs, I don't have signs yet 😃 but I'm sure this oil will work on those signs too. So in short within few days, it vanished all my pimples, worked on marks, enhanced the radiance & improved the skin condition. 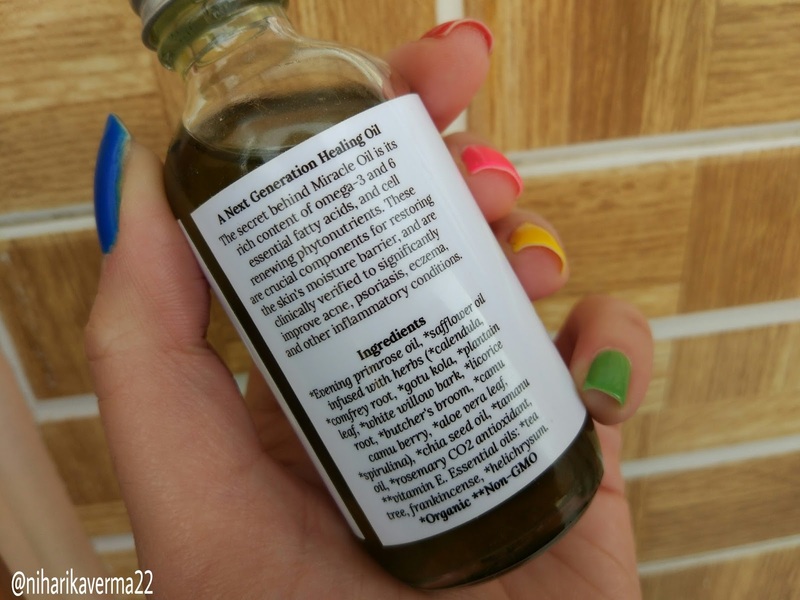 This oil is truly a Miracle. Thank You, LOA Skincare. Made for Eczema, Inflation & Psoriasis. Wow, seriously it sounds miraculous. Thanks for sharing!! Omg this actually work like a miracle I guess. Loved reading it. This sounds like miracle oil 😍 I would love to try this one. Nice review. Thanks for sharing excellent tips on how to get rid of pimples.